“This washer is supposed to be top of the line material!” This type of frustration has been voiced by a significant number of LG washer owners during the past few years. 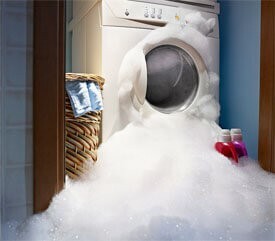 LG promotes their washers as “energy efficient” and tout their LG TrueBalance anti-vibration system as being “designed to reduce washer noise and vibration for smooth, quiet performance in any room of the house[. ]” Unfortunately, LG washers and their TrueBalance technology has been anything but “top of the line.” Consumers around the country have observed LG washers continually running into “rebalancing” issues—generally identified by the error code “UE” flashing on the machine screen—that force consumers to pay for new control panels and/or software fixes, as well as causing the washers to use more water and energy than normal so as to avoid future “rebalancing” issues. I bought an LG top loading washing machine with direct drive a couple of years back. Perhaps a year later, I began to regularly get “UE” error messages (uneven load) which would stop the cycle. I would have to open the door, try to redistribute the wet laundry and then restart the cycle. Sometimes multiple times for 1 load. It would often TAKE LITERALLY 3-5 HOURS to do a single load of laundry!!! Sometimes, the machine will try to correct the idiotic error by automatically refilling the tub with water… I guess in an effort to redistribute the load. This never works. The machine has gotten progressively worse with this “UE” issue to the point that now it stops on 80-90% of the cycles! I often end up having to stand by the machine during the spin cycle until it either stops and gives the error message or begins to refill the tub, then I have to turn off the machine and put the soaking wet clothes into the dryer. Unbalanced Flaw UE – LG Front Loader Extra Capacity – Paid way too much to get extra capacity – would love to have my basic front loader back! Extra capacity is worthless if you can’t get the load to spin & finish because of the UE code. I’ve had to throw away pillows I washed. No problem in my last machine, because this way overpriced LG wouldn’t spin it – not alone, not with other items, not after being wrung out, hung to drip dry, not on low spin – NOTHING. The True Balancer is a joke – it is directly causing the problem. Last year things became decidedly worse when frequent UE errors began to appear and the machine would fill with water to almost the top … I can no longer in good conscience recommend any LG Washing Machine. I have multiple short videos on my phone of the machine filling with water in attempt to balance and with the UE flashing in the background. There is no “True balance” as advertised and if high efficiency means using more water and being prone to developing black mold then the machine is highly efficient, just not in cleaning, conserving water or energy. I was so excited when I bought our LG top loading HE washer in July 2014. I was impressed w/ the features and the fact that it was SUPPOSED to have TRUE BALANCE. What a bunch of crock! Everything was wonderful for the first year and half and then we started getting the UE error message for unbalanced loads on the spin cycle. This problem got progressively worse as time went on no matter how many times I redistributed the clothes, meticulously sorted clothes so that I only washed towels or heavy things at a time. Now I can’t even get one load done in a day, b/c it keeps adding water to REBALANCE the load, or I have to stand over it to watch it spin and turn it off so it won’t add more water or, constantly monitor the weight of the wet clothes, or have to run my dryer for hours to get the clothes dry b/c the clothes never fully went through a whole spin cycle and were still very wet. This machine has actually used more water, and electricity with the all day washing or extra drying. I bought washer and dryers LG (Model WM3170CW and DLE3170W) in Sept 2015. Since that date I made 8 service calls. We had trouble with seal, door, water dripping, UE error code. Due to water dripping with poor seal, we have spot on both machines. We had to wrestling with the customer services. It is the WORST machine we bought in our life. AVOID LG! Considering how much money these washing machines cost, it is inconceivable that they have such fundamental problems. If you have experienced similar problems or seen the dreaded “UE” error code all too often, you should look into hiring an attorney to get back your money. For its part, the national Plaintiffs’ firm Cafferty Clobes Meriwether Sprengel LLP is investigating LG’s behavior, and would be happy to take your call to discuss any potential claims you may have.